There are a lot of Investment and Pension Calculators available online today. They get you to plug in a number of pieces of data, make some assumptions and then tell you an answer. This might be your total projected pension fund, your projected income or even the probability or reaching a financial goal. I find these a useful tool and use them regularly except I find they have one failing. They only ever give you a single answer based on the data you enter and don’t show you a helicopter view of how the various factors that Mr Market throws at you combined with the decisions made by the Average Investor interact. I therefore decided to build a simple Retirement Investing Today model in Microsoft Excel and have found it informative. I hope you do to and as always would welcome your feedback. Before we look at the model let’s first look at why I decided to run this analysis in the first place. In the circles that I move (both in the flesh and online) there seem to be broadly four types of Retirement at play. Some people have planned for one type and achieved their goal but in many other instances people have planned for one and failed miserably. How many times have your read or heard people say that I was on target to Retire by 50 (or some other random number) but then the market crashed and so now I’ll have to work a lot longer than planned. Why do people get it so wrong? I want to know so that I can avoid the same mistakes. At one end of the spectrum is Early Retirement Extreme. Jacob over at Early Retirement Extreme is probably the poster boy for this type of Retirement. Even though he is currently working, under my definition of Retirement, which is that work is optional, he is very much retired as his latest post reveals he only requires 2.1% real (after inflation) return on his investments to live the life he desires. A person targeting Early Retirement Extreme wants to become financially independent as soon as is physically possible (Jacob made it by age 30) and is prepared to live a very different lifestyle from the majority to get it. Some might say they are not living. I would say they are just living differently. The Early Retirement Extreme person will save a very large portion of their income (Jacob saved >75% meaning he was living on $5-7,000 per year). To be able to save this level it is likely that they will be living in very modest accommodation, they will walk/bus/train/bike everywhere and certainly won’t own a car, will eat home made meals which may even be made from growing/raising their own ingredients, will have a go at repairing anything rather than throwing it out and will be very infrequent visitors to any form of shopping centre. While a very different life to the majority in the western world today it does looks like a very sustainable way of life and maybe if more people followed this route the world wouldn’t be seeing some of the challenges of today. That said, it is not for me. Holistically it’s a very attractive option but if I look in the mirror and take a long hard look at myself I realise that for me and my family it’s just a little too ‘Extreme’. At the other end of the spectrum is Typical Retirement and Late Retirement which are closely aligned. I see a number of reasons why somebody ends up in the Late Retirement situation. At one end of the spectra they may have just bet everything on black – an example could be a business venture which they put everything behind and which went wrong. At the other end they may have just made some bad investment decisions or assumptions. They then reach a Government mandated age and realise that the ‘extras’ they get at this age won’t give them the lifestyle they are accustomed to and so choose to work on. Typical examples could be the UK State Pension Age (somewhere between 60 and 68 depending on who you are with the precedent suggesting this number will only increase going forward). They get to this age and realise that if they take the UK Basic State Pension for a single person of £107.45 per week plus the little extra they get from the UK Additional State Pension plus their limited investments they end up with a large cut in their lifestyle. Alternatively, it could be a Government dictated age like 55, which is when you can currently take a Personal Pension, where similar problems could exist. Maybe the annuity they would receive or investment returns that their private pension spins off means one too many life sacrifices. Typical Retirement is a similar problem. The difference is where the Late Retiree chooses to work longer to maintain a lifestyle; the Typical Retiree retires when the Government tell them they can and then likely takes a cut in lifestyle. This could be simply due to Herd Mentality but it could also be because they have no other sources of income, other than what the Government allow them, and don’t see/have the potential/benefit/willingness to create one. I personally don’t feel like being told by the Government when I can and can’t Retire. In attempt to prevent this at no time do I count the UK State Pension in any of my Retirement calculations. If I receive anything many years down the road it will be treated as a bonus. I also don’t put all my eggs in the Pension basket as the rules here can change at any time. Finally I spend a large amount of my time attempting to understand the financial markets so that I can minimise my risk of failure. In between these extremes is fourth type of retirement and the one that I am chasing – Early Retirement. If you want to be within this group whether trying to Retire by 40, Retire by 55 or some other magic number then to make it you need to understand the main factors that influence whether you get you there. This is where my model comes in. If you are already in this group then you’ve either already figured it out and so don’t need to read on (but it would be nice if you did and shared your experiences for others to learn from), have won the lotto (congratulations) or were just plain lucky (again, congratulations). 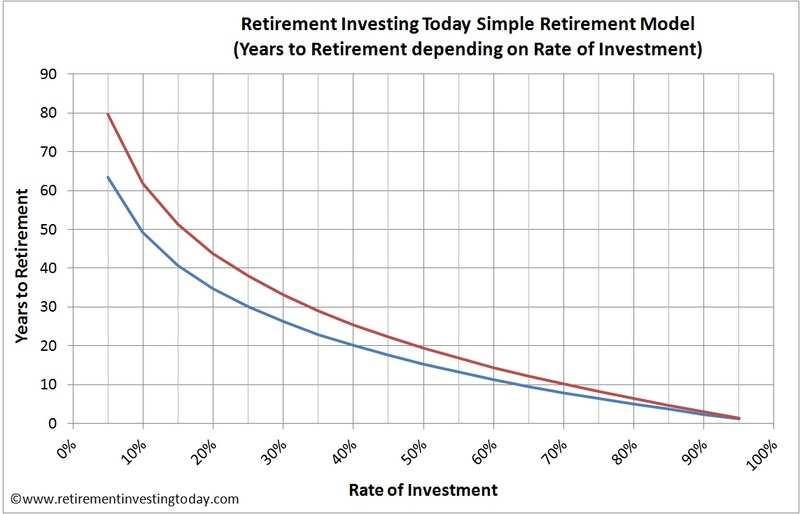 The Retirement Investing Today Simple Retirement Model and the Average Joe Example. Before we look at the model and example I must reinforce that everybody in this world has different needs and different risk profiles. Additionally this model is not the answer and is merely intended to show the interactions between the 4 main factors that I feel affect whether you end up with Early Retirement Extreme, Early Retirement, Typical Retirement or Late Retirement. It also greatly simplifies a complex problem to aid learning. Finally, a myriad of assumptions are needed to build a model like this. Some are shown below but I surely have also failed to communicate some also. After the post I show a copy of my Excel sheet workings which developed the model so that you can replicate and tweak the model if desired. The Model is shown graphically below and will be used for the Average Joe Example. There are three key variables which need to be changed for an Average Jane or Average Bob. These are what I refer to as Rate and Rate2 which are detailed and explained in the Excel sheet plus the amount of investments that already exist. The model is essentially the NPER function available within Microsoft Excel. The example run today looks to remove the effect of inflation plus assumes that Average Joe continuously looks to minimise taxes and investment expenses. The model is designed to enable an output that can be charted. The x-axis is the Rate of Investment. This is the percentage of after tax earnings that are invested. The y-axis shows the number of years until retirement can occur. I’ve assumed that after inflation, taxes and investment expenses Average Joe calculates that he can achieve an Average investment return of 4.5% while he is saving for retirement (accrual) and can achieve 4.0% while in retirement drawdown (assuming he doesn’t buy an annuity). The red line represents what I have called Low Risk. This assumes Average Joe is actually more conservative than Average and assumes that his investment returns will actually only be 4.0% and 3.5% respectively. The blue line is the exact opposite and represents Average Joe assuming a more bullish return on his investments of 5.0% and 4.5% respectively. Average Joe is 20 years old and has no investments in place yet. After inflation contributions remain constant during the accrual phase. Low Risk and High Risk are just relative terms to demonstrate a point with everyone defining Risk differently and having different levels of risk tolerance. Let’s assume Average Joe starts out thinking he will achieve the Low Risk growth rates. 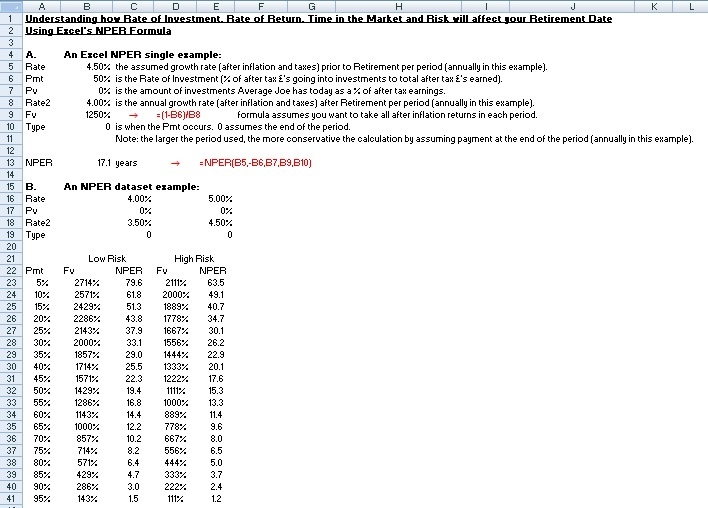 The model tells us that if his Rate of Investment is 10% then retirement is predicted in 61.8 years. Think about that for a minute. In this scenario he would not be retiring until he is 81.8 years of age. I can’t help but feel that this point alone shows why so many people end up with Typical Retirement or worse. Average Joe says no way to that future. He instead decides to live frugally and up his Rate of Investment to 60%. All of a sudden 61.8 years becomes 14.4 years. Now he’s a Retire by 35 kind of guy retiring at 34.4 years of age. That’s now trending towards Early Retirement Extreme and is certainly Early Retirement. Average Joe then thinks that he doesn’t really want to live the lifestyle that this requires. After all, this idea means he has to live off 40% of his total after tax earnings. He does however like the idea of retirement in around 15 years. He therefore decides to back his Rate of Investment off to 50% but instead becomes High Risk with his assumptions. If it comes off he’s retired in 15.3 years and so stays Retire by 35. If however the actual market return is Low Risk then he’s now retired in 19.4 years which is some 4 years later. Keeping the Average Joe example in mind let’s now look at the 4 main factors that the model attempts to encompass. Rate of Investment. Assuming that somebody doesn’t want to change their standard of living pre and post retirement, the rate of investment has a large influence on the retirement date. This is because the Rate of Investment provides two characteristics. The first is the obvious one, which is that the larger the Rate of Investment the more money there is going into investments. The second though is that the larger the Rate of Investment the less money the investor has for his current lifestyle. 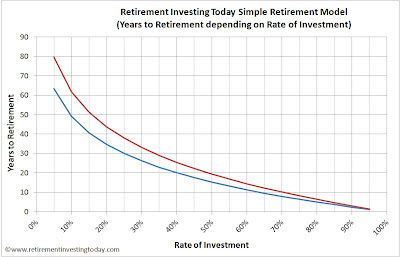 This means that if you are investing more today and maintain that lifestyle in retirement then you actually need a smaller investment pot to live on than the person with the lower Rate of Investment. 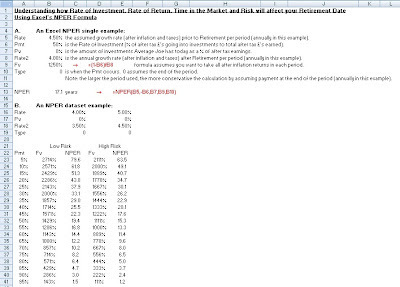 Rate of Return and Time in the Market. If you’re reading Retirement Investing Today then you probably already know what compound interest is. This chart however demonstrates how much it affects each type of retiree. If you’re looking to go for Early Retirement Extreme then compound interest has limited effect during the accrual phase but is very important if you’re looking to Retire by 60. This can be seen on the chart by looking at how the two lines diverge as the investment rate decreases. For example assume Low Risk and an investing rate at 70%. If the growth rate during accrual is 4% he’s retired in 10.2 years. Drop that rate to 0% and he’s retired in 12.2 years which is an increase of only 2 years. If he’s more in tune with Retire by 60 then compound interest becomes far more important. For example again assume Low Risk but this time an investing rate of 25%. If the growth rate during accrual is 4% he’s retired in 37.9 years. Drop that rate to 0% and he’s staring down the barrel of 85.7 more years until retirement which is an increase of 47.8 years. Risk. The higher the assumed Rate of Return for a constant set of investments the more likely you will miss your target. In our Average Joe example let’s say he selects a Rate of Investment of 50% and assumes the conservative Low Risk returns. If reality turns out to be Low Risk he’s Retire by 50. If however the actual return turns out to be High Risk then he has all of a sudden become Retire by 35. How nice a surprise would that be? If however he assumes High Risk from the outset and still targets Retire by 50 then his Rate of Investment might only be 25%. If he only gets the Low Risk Return then all of a sudden he’s at Retire by 105 or more likely Typical or Late Retirement. The rate of investment, rate of return achieved during accrual and drawdown, time in the market, risk and basic assumptions can have a massive effect on when and what retirement is for people. I hope this post with its very simplified example has given a little insight into this. What I also hope this post has shown is the importance of doing your own research and just not believing what Online Calculators are telling you. Instead understand what it is calculating and importantly understand how sensitive it is to variable changes. I would welcome your feedback as I’m trying to learn as I write these posts. I would also welcome questions. Excellent post, (and blog), apologies this is a bit off topic. Quick question, how do you model or consider leverage? If you have significant assets you can borrow at low fixed rates, e.g. 1.5% real. By your assumptions, surely when you are young it would make sense to borrow to invest in risky assets ? Unfortunately I can't gove an opinion as I don't use leverage for any of my investments. My belief is that debt of any description should and can be avoided as when you are in debt somebody 'owns' you. Let me give just one off the cuff example. Let's imagine a simple stock/bond asset allocation. Everything is going well and then all of a sudden we see a 40% fall in stock prices. In this situation my emotionless mechanical non-leveraged investing style would likely force me to sell bonds and buy what are likely to now be 'cheap' equities. The person using leverage would be selling also however they'll be selling to meet the margin calls. I don't want or need that pressure. Instead I believe that by living frugally, minimising fees, minimising taxes and adopting a sensible investment strategy one can achieve early retirement without any other complexity. The only time I would consider debt would be on a mortgage for a home to house my family. Although I'm not in that situation today as I'm renting. Also if the market continues its slow drag downwards over a period of years, which looks the likely scenario from where I sit today observing all the market distortions, I likely won't need one. This will be because I will become a cash buyer by the time property reaches fair value. I would welcome your (or any readers) thoughts as debt avoidance is quite a different strategy to the norm today. I agree with your points. I doubt that any leveraged investment funds would be value for money. Furthermore historical experience with endowment mortgages suggests the financial industry is unlikely to give out free lunches. I was really thinking of a simpler example. b) Liquidate as few of your assets as possible and have a larger mortgage? Implicitly your decision over the size of your mortgage is a decision about how many assets to liquidate, and how leveraged do you want to be? A similar question could be asked, is it better to over pay on your mortgage or invest in low cost index funds? If you have high equity in your home, you can borrow at 3%-3.5% nominal, and are employed, you have essentially zero risk of a margin call. Given your assumptions above, you may get a higher return if you invest than if you pay down debt. By borrowing to invest, (or not minimizing debts) you would also diversify your risks over time, and increase your time in the market. All of the above assumes investing in using ISAs in low cost index funds with minimal taxation, and ignores political risks. I really don't know the answer, in the past I would have agreed with you, keep it simple, pay down the debt, then invest with zero borrowings. Now I'm not so sure. I think all the above would work even if you did not own a home, there just might be more risk of a margin call or difficultly obtaining low cost finance due to lack of collateral. Oh and you are entirely correct about the over rated benefits of owning a home. Have you uploaded a copy of the spreadsheet you mention in the post above? Thanks for clarifying and bringing forward what sounds like a good debate. Mathematically (ie no emotion and mechanical) there is probably a right answer in there that gives the largest theoretical gain. It would involve consideration of crystallised taxes (ie I’m guessing capital gains may come into it if you were liquidating gains above your annual allowance), the value of lost tax benefits (ie if you liquidating ISA’s where you never get the chance for that yearly allocation again), your risk profile plus expected market gains/losses (both the home you have just bought and your retirement portfolio that remains). I haven’t crunched the numbers and there probably isn’t much point me doing so as I think those variables will be different for every reader of Retirement Investing Today. 1.The house I buy will not be an investment. Instead it will be a home for my family. Therefore I will not count it as part of my property assets within my Retirement Investing Today portfolio. 2.I am not going to look for the highest theoretical return as only time will tell where the efficient frontier between the home and investments sat. I am instead going to focus on getting rid of the debt as fast as possible while minimising the tax I pay. 3.For my Early Retirement to work in the timescales I am predicting I have a value of house in mind. So here goes. I cannot liquidate anything from my pension as I am only late 30’s so that’s part of my portfolio not contributing to the house fund. I’m not going to take anything from my ISA as that is an income stream that will never (as long as government don’t change the rules) have to pay tax so that’s another portion not contributing to the house. I would leave my emergency fund in place so that’s another portion not contributing. Then comes the investments outside of wrappers that I won’t liquidate as they would be exposed to capital gains tax. So that means I’m left with liquidating value X. What remains in the portfolio I rebalance back to as close to my target allocation as I can get while minimising taxes and fees. Any gaps get closed by reinvesting dividends from within the ISA and Pension into the furthest from balanced part of the portfolio. My pension contributions also stay and get altered to be investing into the furthest from balanced portion also. I will also continue to pay my regular contributions into the ISA as you never get that chance again using the contributions to balance also. That liquidated portion plus my wife doing something similar represents about 2/3’s of the value of the home I intend to buy. A quick web search shows that the best rate for a deposit of that size is likely to be 3.2% or so. This is I believe now the key. I now direct the dividends from the non wrapped investments, any cash that would have been saved outside of the wrappers plus the now saved rent payments to the mortgage. My wife does the same. Quickly running the maths reveals that for us the mortgage is then repaid in a little under 3 years. I then have no mortgage or rent to pay. The final year before Early Retirement then becomes interesting as I can then add these payments to my 60% normal savings rate to really turbocharge the portfolio. I think that the key that really helps make my situation unique is that I have a very high savings rate (ie live well below my means), wish only for a home that I know will satisfy my family’s needs while being far below what I can afford, have a large deposit and have a wife who is like minded. Of course that's all theory and only time will tell what happens when I push the home go button. When that day occurs I will of course post about it in far more detail. The only question is when will the market encourage me to dive in. Thanks for contributing to the debate. Please don’t misunderstand me. For my situation I believe that Pensions are suitable and worth the risk. Of course, they may not be for everyone and that’s why I always say to DYOR. At the time of writing this reply I have 38% of my net worth invested in pensions. Even though I could squeeze more return by larger contributions I choose not to. This is I believe a risk minimisation technique. What I’m trying to say (and maybe I didn’t communicate it very clearly in the post) is don’t let the government dictate when you can retire. That’s why I’m only at 38% and not a much higher number. Instead take some control away from them. When I say this it’s important to consider that I believe going forward governments can and will change the rules. The problem is that I just don’t know what those changes will be. One example. Imagine just a few years ago planning for Retire by 50 by maximising the tax deferral (remember pensions don’t give your taxes back as you mention but instead only defer your tax payment to what is hopefully a day where you are in a lower tax bracket/s) available in pensions by investing 100% into them. Then the government comes along and says from April 2010 you can now only take your pension from 55. Feel like working an extra 5 years? A second example using your example of the low loan to value mortgage combined with the tax free lump sum. That sounds really good in theory and it is something I have also thought about. The challenge is how to as you say efficiently tax plan (and I have been saying since I started this blog in 2009), minimise expenses and stay flexible enough to be able to cope with government rule changes. To demonstrate, how would your proposal work if the government abolished the tax free lump sum? Some good points. I'm in this game for a long time - hopefully 50 or so years. You're right that today annuity rates are low but will it always be thus? Additionally, when I think of taking my pension I wasn't thinking of annuities. Where I sit today, which is more than 15 years from being eligible to take my pension based on the current 55 date, I am planning on going for Income Drawdown. It seems a better deal for me at least. Of course I may change that opinion (maybe even multiple) times as the day draws nearer and more information comes to light or rules change. Good point on the grandfathering provision. I guess that's the luck of the draw. Sometimes they'll offer it and sometimes not. We just don't know. Would you be prepared to share what percentage of your savings you have and are placing in your pension as it might help the debate? I'm very transparent and currently have and am looking to maintain around 38%. Thanks for sharing your details. When commenting above it sounded like we were quite far apart in our Pension strategies however now I'm thinking we might actually be quite close. You have around 10 years until you can access your pension where I have a bit over 15 years. Therefore you have less timing risk that the Pension rules will change so can accept a higher weighting. What age are you and your better half planning on retiring? I'll be early forties meaning I have to live for a long time before the Pension activates. Again, if you're planning on being later than that I can also see why you might have a higher weighting to Pension. I agree with all of your assumptions. I hadn't appreciated you would still be using up your full ISA allowance. But consider the final year of your hypothetical mortgage. You would have virtually no default or liquidity risk. a) pay off nothing and pay 3.2% nominal on one years savings worth of mortgage debt, and invest savings as above with expected 4% + inflation. b) pay off mortgage and invest nothing, for effective return of 3.2% nominal. So ignoring all the details like tax and transaction costs, you could be better off not paying of the mortgage and investing the savings instead. However, if you actually run the numbers the expected gain is very small, 6%-3.5%=2.5% of one years saving. Which probably isn't worth the extra risk and complexity, especially if it were done using SIPPs rather than ISAs. Might be worth it if you had a choice between filling your ISA allowance and paying down the mortgage, i.e. if your joint savings were less than £22k. Still interesting, I had assumed that borrowing to invest was always a terrible idea, but I guess it depends on the precise details of each situation, and greatly on the taxes and fees. Either way, cheers for the site, full of good information. I agree I would have no default risk on the mortgage. To keep the debate going I will however stay devils advocate. I originally wrote a very long reply here but I've now deleted it and gone for a short one emphasising one point. The big risk you are missing is that I am near retirement and therefore don't have time to rebuild capital should the market tank. I need that money in the market to pay the mortgage off. Your method works (ignoring taxes, expenses which must be included) only if your capital stays the same or increases. What if the opposite is true? To me you're almost proposing placing a bet on red, all for 2.5% of one years savings, at a time in life where there is no need. That is not what Retirement Investing Today is all about as I feel you are carrying to much risk for that point in life. Also, thanks for the great debate. I hope others are also finding it useful. As ever thanks for the reply, this is really helping to clarify my ideas on this. a) Put all your savings into paying down your mortgage. b) Fill your joint £22k ISA allowance, and use remaining annual savings to pay down your mortgage. I think you are planning to do b). But you would pay off your mortgage quickest if you did a). Yet, b) is sensible because you would permanently lose your ISA allowance if you don't use it each year. Which would limit the savings and investments you can shelter from taxes in the future. Under b) you are effectively borrowing money against your home to fill your ISAs. But you are not doing this to speculate for capital gains or because the interest rate on mortgage debt is lower than the expected investment returns, so much as for the long term tax efficiency of having a greater ISA allowance. Just to give you an idea of where I'm coming from: we bought a home in '09 using an offset mortgage. We've paid the majority of the mortgage off, and are on track to pay off the remaining balance in the next year and a half. However, as yet, we've no savings in ISAs. But I'm starting to think that given the modest balance remaining on the mortgage, it would be better to fill our ISA allowances each year, and take slightly longer to clear the mortgage. Great debate. I think we have actually converged on pretty much the same answer. Yes, I would still try and fill my ISA every year even if I had a mortgage today. This is because minimising taxes is a key element of my strategy. Of course, this is easy to say as I don't have a huge debt hanging over my head today. Would I change my strategy if faced with all those zero's in red on my balance sheet? Only time will tell but I don't think so. By paying the mortgage I save some interest today and minimise risk by reducing the remaining period of the mortgage. However the ISA is a different thing all together. By paying into it today you get part of a tax free retirement income for the rest of your life. That to me seems to good to surrender. Even though I have said this the risk of associated with the mortgage still troubles me. Lose your job or fall ill and in the best case you may have to sell some assets in a non tax efficient manner. In the worst case the market has tanked as well and you could lose all your savings. I guess I just don't like debt. My extreme saving is me trying to get the best of everything - a nice healthy SIPP/Pension, a full ISA plus a home to call my own. Cheers for the really healthy discussion. Likewise, cheers for a great discussion, v. informative. I look forward to hearing how your investments progress, sounds like you've got it all well figured out. I agree with Anonymous -- in fact I actively want a mortgage more than I want to buy a what I consider still over-valued property, just for the mortgage that comes with it. how come you consider the interest rate, net of the inflation, 4.5%? I live in Switzerland and the banks give maximum interest rate 0.35%, and that's even les than the inflation rate. How can i make my savings increase like this? In what kind of investments? Stock market dividends are way above 0.35%, so if you invest part of your money in the stock market, you achieve much better returns than on your bank account. You should read up on investing to understand the implications and risks first, though. PS: The inflation rate in Switzerland is currently negative, so you still have real returns even on bank accounts.